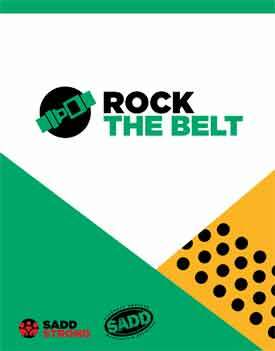 We are pleased to present Rock the Belt, a SADD national core program that uses peer-to-peer based prevention strategies to engage schools, parents, and communities about the importance of wearing seat belts in every vehicle, every seat, every time. Research by the National Highway Traffic Safety Administration (NHTSA) indicates that motor vehicle crashes are the number one killer of teens today. Of these deaths, 54% of teens (13-19 years old) were unbuckled. Rock the Belt is designed to address these statistics. Mississippi SADD, in conjunction with the Mississippi Office of Highway Safety started Rock the Belt. Shortly after, a NHTSA-funded evaluation concluded that Rock the Belt increased seat belt use among teens. Indiana and Illinois SADD adopted the program, and the SADD national office named it a core SADD national program in 2015.